We're slowly working on sprucing up our bedroom which is just really drab right now. The closet has no doors (and thus exposing my almost embarrassing huge collection of clothes), we only have ugly plastic blinds on the windows and no art on the walls. So I started with the easy part this past weekend, I made curtains! It was really nice to work on my sewing machine again. I've forgotten how much I love making things. Last weekend's project has definitely put me back in the sewing mood again, I even made a tote after I finished the curtains just because I was having so much fun. I hope I can keep this up! 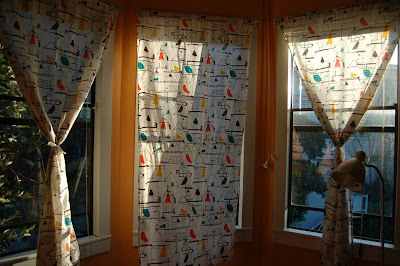 The curtains are up in the sewing room right now, we'll see how long it take for us to move them over to the bedroom. 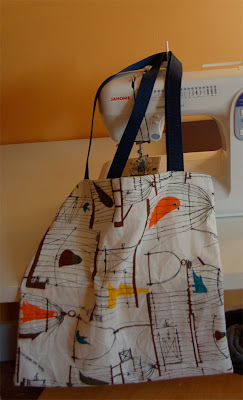 I made the tote for my flickr friend, hanssolo, to belatedly thank her for sending me her wonderful art . I checked out hanssolo's drawings and they're awesome. how did you get it? is there a shop? btw, your blog is such an inspiration, I just bought one of the calendars you recommended. we're in search of artwork. i never thought there would be such wonderful stuff on etsy.